Spring classes are still enrolling. Schedule a tour ASAP! 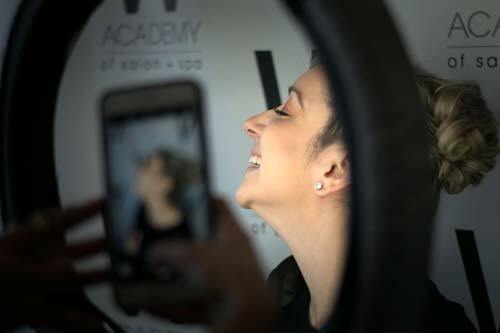 JD Academy helps aspiring hair, skin + makeup artists forge paths into long, profitable careers in the salon + spa industries. Hectic work, family & life schedule? We get it and will happily work with you to find a schedule that fits. We know everyone can’t drop all of life’s responsibilities full-time. We’ll help you find a schedule that works. As a nationally accredited school, our programs are eligible for state & federal financial aid for those who qualify. Our team will help. We work with academy graduates to build door-opening portfolios and leverage our vast network of salons + spas. Tuition, class schedules, the process and more – learn more about admissions & enrollment. Our mission is to never let cost be the hurdle that stops you from achieving your goals. An amazing salon + spa experience in Downtown Danville that doesn’t break the budget. The JD Academy Student Salon + Spa services are offered in a real salon/spa-like facility where our senior students are working to build their portfolios. All work is done under the direct supervision of our licensed, professional staff. With a 4-star rating on Yelp, you won’t be disappointed and you won’t find a better value for salon and spa services in The San Francisco Bay Area. “After leaving my previous school I felt a little defeated. I was in a place where I felt lost.